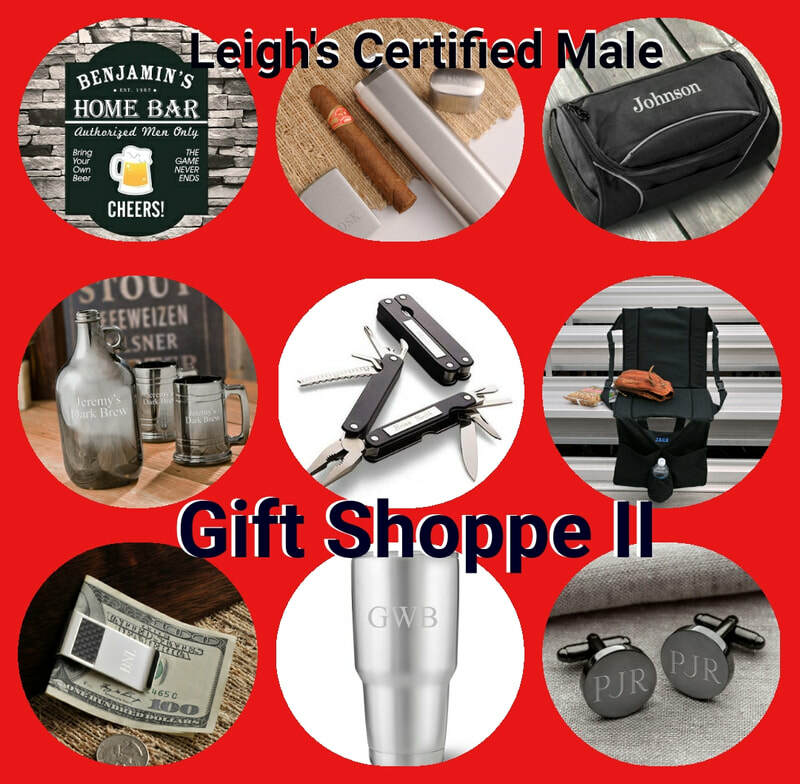 More Than An Online Gift Store! 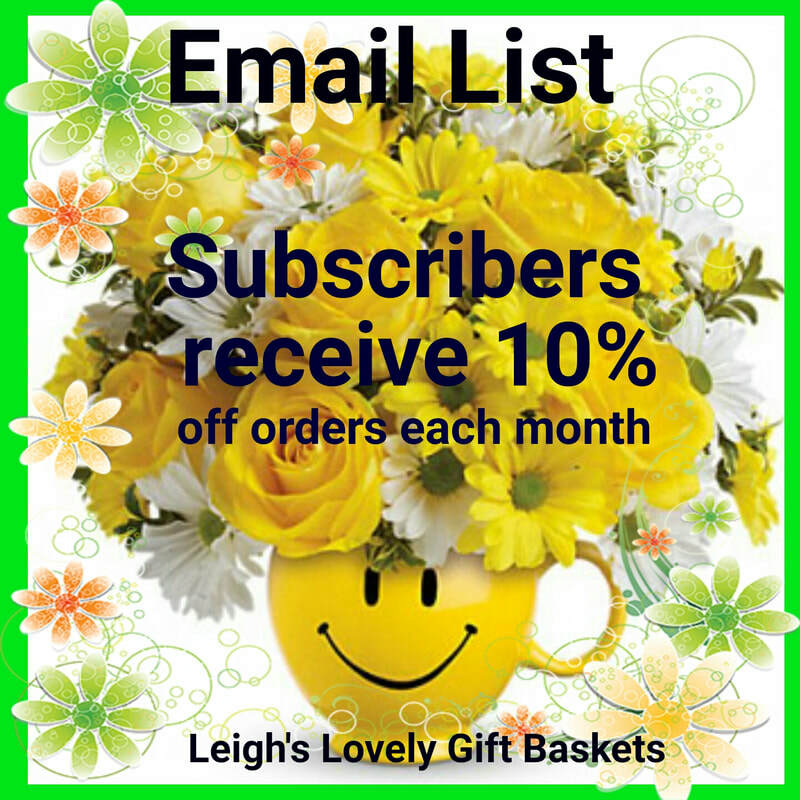 Click here to connect to Leigh's Email List Page and sign up for monthly emails. 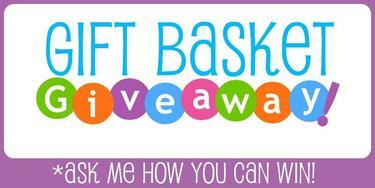 Click here to connect to La Bella Baskets Monthly Basket Drawing. 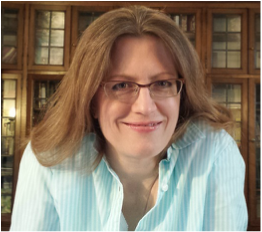 Click here to connect to Leigh's Customer Service Page. Contact information can also be found at the bottom of each website page. 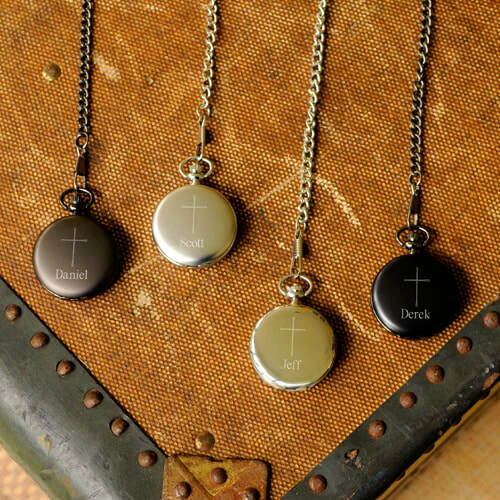 Inspirational Pendant $21.99 Leather necklace with circle-shaped pendant includes a small cross and room for name or initials up to six characters. Choice of red, black, brown, and pink leather necklace. 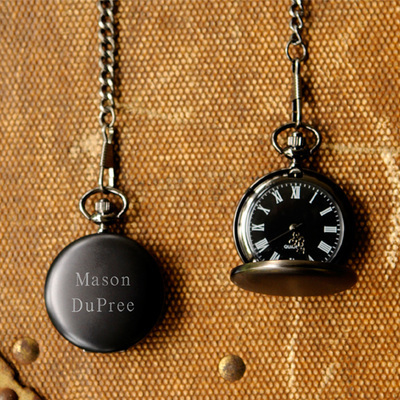 Women's Clock Pendant $34.99 A beautiful personalized gift for Bridesmaids or any occasion! Single initial engraving available only. 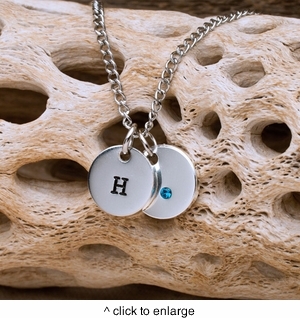 Swarovski Crystal Charm Necklace $29.99 A sleek, contemporary look for birthstone jewelry! High quality chain measures 24 " open and 12" closed. Choose your birthstone and initial. 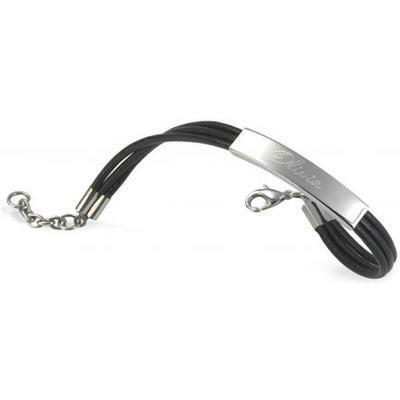 Leather Rope Bracelet $26.99 Discontinued - Limited Stock Stainless steel and genuine leather bracelet is stylish and easy to maintain! 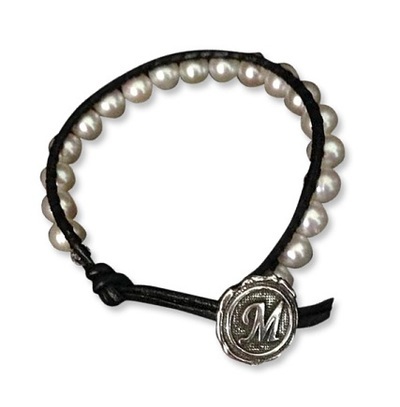 Soft leather bracelet is adjustable with a lobster clasp and is available in black, dark brown, dark red and pink. Personalize with one line up to 15 characters. 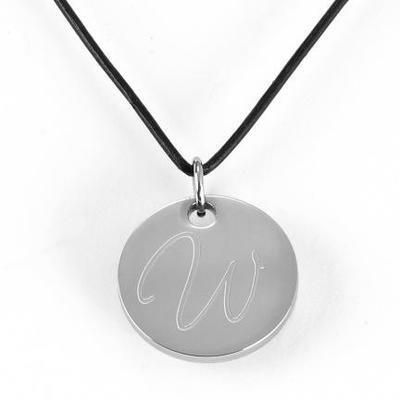 Round Leather Necklace $20.99 Leather and stainless steel necklace is rugged, scratch resistant and easy to maintain. 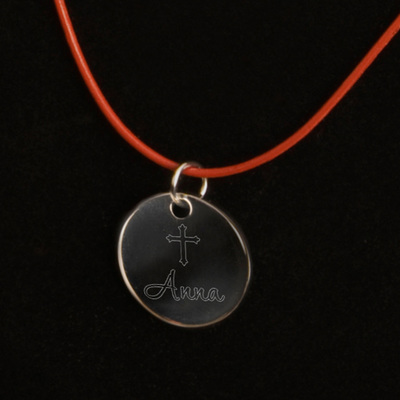 Necklace is expandable up to 35-inches, is available in black, brown, red and pink and can be engraved with up to six letters. 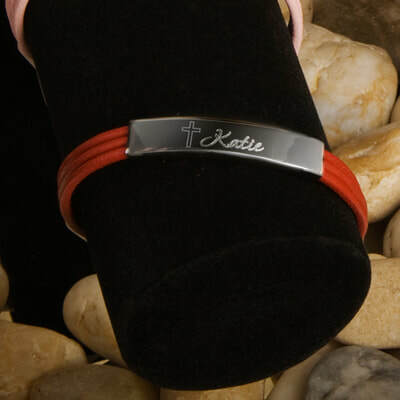 Inspirational Leather $26.99 Discontinued with Limited Stock Stainless steel and leather bracelet with engraved cross and lobster clasp is suitable for men or women. Available in Dark Brown Dark Red, and Pink with adjustable sizing . Can be personalized with 1 Line of up to 10 Characters. 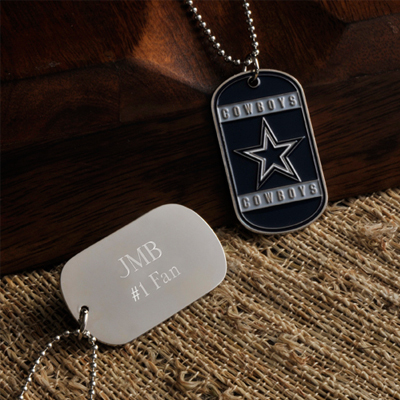 NFL Dog Tag $20.99 Support your favorite NFL Team with this easy on and off chain necklace that can be personalized with two lines with up to 15 characters each. All NFL teams are available. 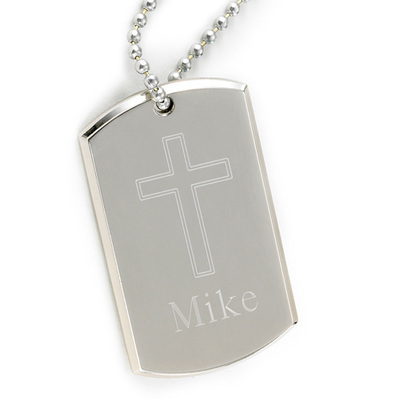 Large Inspirational Dog Tag $19.99 Contemporary designed, nickle plate finish dog tag necklace features a beveled-edge, simple engraved cross and a long, sturdy chain for easy on and off. A great gift idea suitable for both men and women. Personalize with one line up to 10 characters. 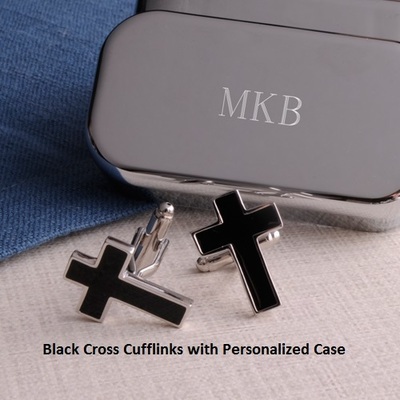 Cross Cufflinks $24.99 Contemporary styled cross cufflinks are perfect for formal occasions, religious ceremonies and everyday wear. Personalized case with two lines of up to 15 characters. Midnight Pocket Watch $34.99 Classy pocket watch with black finish, black face, white Roman numerals, quartz movement and a secure, 14" removable chain. Personalize with three lines up to 10 characters each. Inspirational Pocket Watch $34.99 Simply elegant, contemporary designed pocket watch with engraved cross, quartz movement and sturdy 14" chain with secure clip. Available in gunmetal, brushed, polished, or midnight finish. Personalize with one line of up to 10 characters. 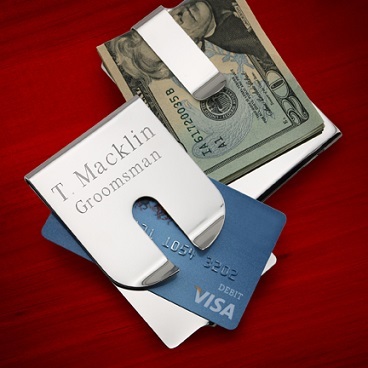 Polished Clever Money Clip $25.99 Lightweight and durable money clip with brushed finish. Personalize with two lines of up to 15 characters each. 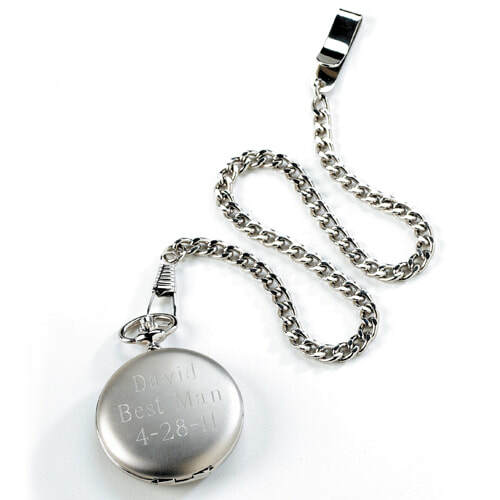 Brushed Pocket Watch $34.99 Silver pocket watch with brushed finish on engraved cover. 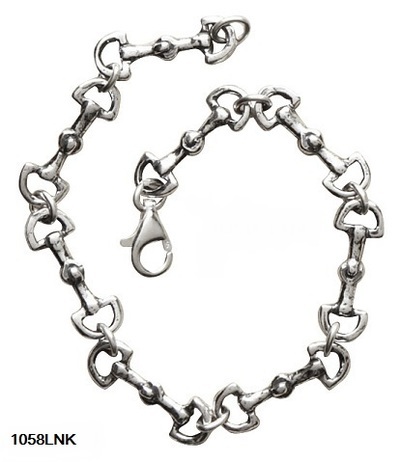 and 14" removable chain. 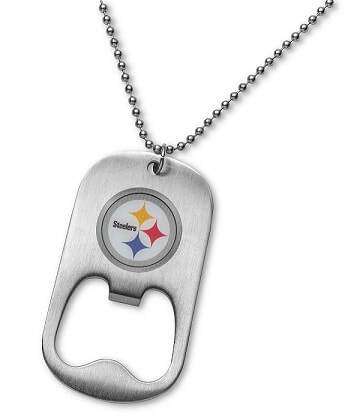 NEW NFL Bottle Opener Dog Tag Necklace $24.99 Stainless Steel ball chain necklace and pendant with bottle opener. 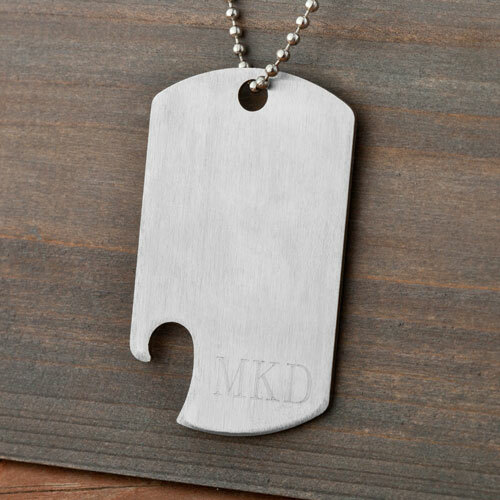 Dog Tag Bottle Opener $18.99 Stainless steel military style dog tag bottle opener with ball chain necklace is customized with three engraved initials and designed with a bottle opener corner. 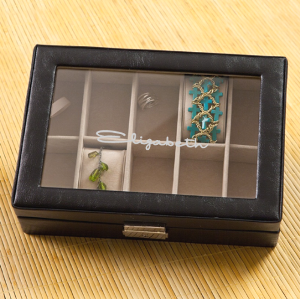 Women's Leather Jewelry Box $58.99 Display and protect her jewelry with this beautiful, black leather jewelry box with a glass hinged lid. Inside are 10 khaki suede-like velvet compartments with removable pillows. 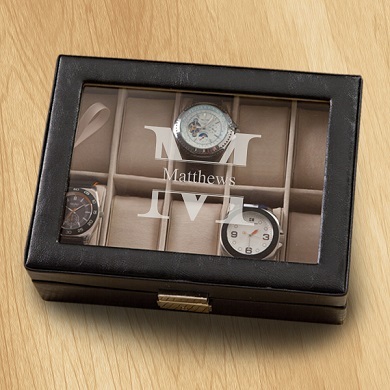 Men's Watch Box $58.99 Black top-stitched leather watch case with glass hinged lid,10 khaki suede-like removable velvet cushions and a polished nickle clasp closure Personalize with one initial . 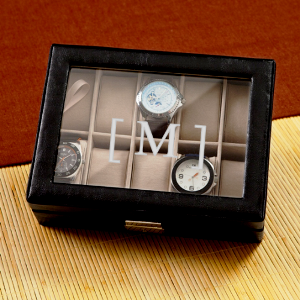 NEW Monogrammed Men's Watch Box $58.99 Leather top stitched case with glass hinged lid, suede like velvet cushions and polished nickel closure. Available in three monogram designs: Stamped, Modern and Family Circle. Personalize with one line up to 15 characters. Brown Men's Crocodile Watch Box $53.99 Faux leather top stitched case with glass hinged lid has 6 suede like removable velvet watch cushions and a polished nickle clasp closure. Personalize with one line of up to 15 characters. 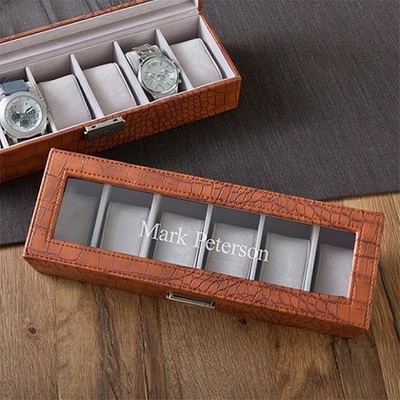 Men's Watch Box with Sunglasses Holder $58.99 Handsomely designed holder with glass hinged lid, 4 khaki suede-like removable velvet watch cushions, polished nickel locks. Personalize with one line up to 20 characters. 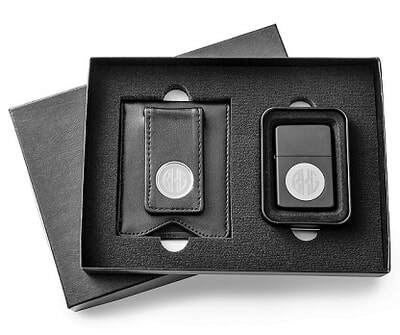 Black Leather Wallet and Black Lighter Set $59.00 Personalized set makes a nice gift for him for any occasion! 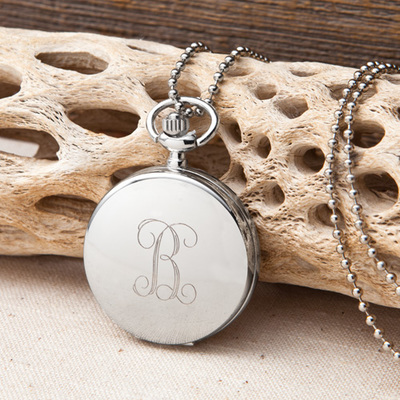 Personalize with his Monogram for a truly thoughtful gift! 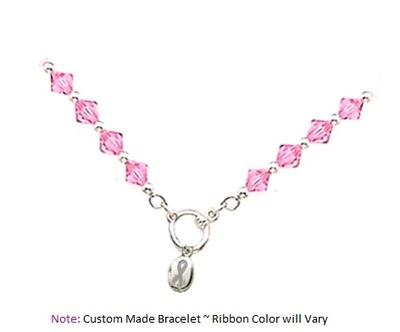 Breast Cancer Awareness ~ Pink Crystal Charm Bracelet $49.99 Genuine Pink Swarovski Crystals, Sterling Silver Beads, Sterling Silver Toggle closure and a FREE Sterling Silver Ribbon charm. 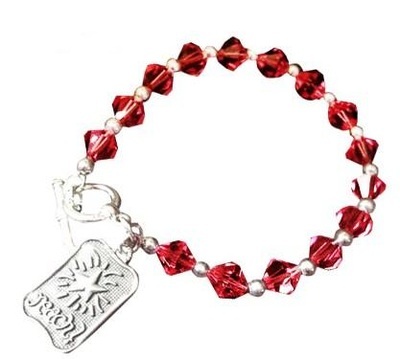 Genuine Swarovski Birthstone Crystal Bracelet w/ FREE Charm $54.99 A beautiful interplay of Genuine Swarovski Birthstone Crystals and polished Sterling Silver beads with Sterling Silver toggle closure. Includes a free Inspirational Charm. 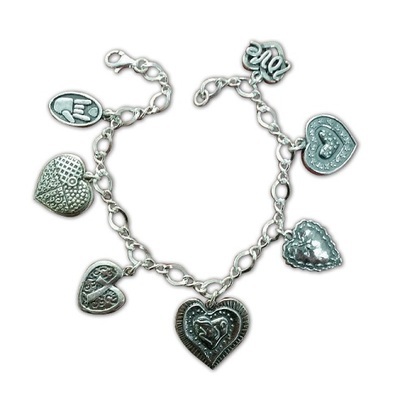 Simple and Sweet with Heart Charm Bracelet $38.99 This 100% Sterling silver charm bracelet with one heart hanging from the middle is simple and sweet. 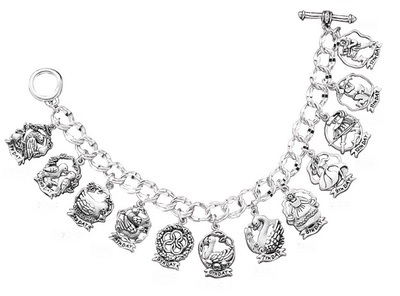 Love Love Love - 7 Heart Charm Bracelet $124.99 6 beautiful 100% Sterling Silver heart charms and 1 sign language “I love you” charm hang from this sweet figure 8 style charm bracelet. 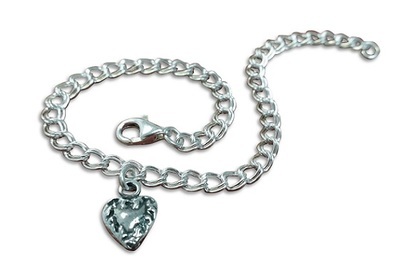 Tiffany Inspired - Toggle Heart Bracelet $109.99 Stunning Tiffany style 100% Sterling link bracelet with engravable heart that dangles from the end. Personalize with one Block Initial or Date MM-DD-YY. 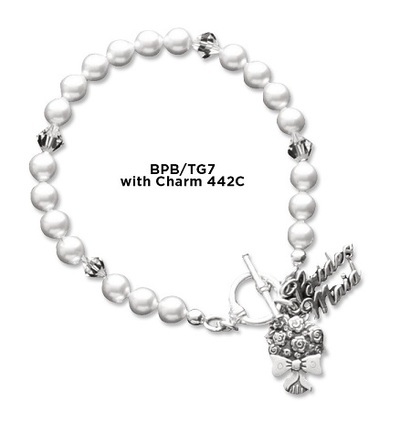 Bride and Groom Pearl Swarovski Crystals Bracelet with Toggle $62.00 Beautiful strand of freshwater pearls interspersed with brilliant Swarovski Crystal and sterling silver toggle closure. Bride and Groom charm. Flower Girl Bouquet Pearl and Swarovski Crystals Bracelet with Toggle $52.00 Beautiful strand of freshwater pearls interspersed with brilliant Swarovski Crystal and sterling silver toggle closure.Small basket of flowers with words " Flower Girl "
Bridesmaid Bouquet Pearl and Swarovski Crystals Bracelet with Toggle $60.00 Beautiful strand of freshwater pearls interspersed with brilliant Swarovski Crystal and sterling silver toggle closure. 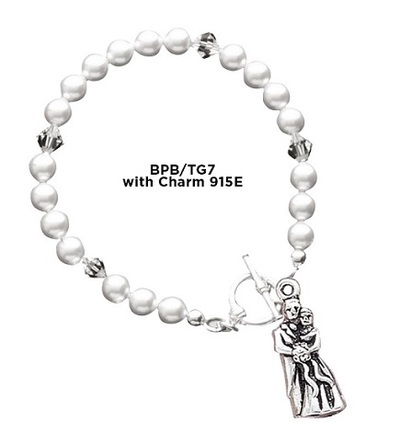 Bridesmaid bouquet with word " Bridesmaid "
6 Inch Twelve Days Of Christmas Bracelet $220.00 Special Edition Charm Bracelet is .925 Sterling Silver. 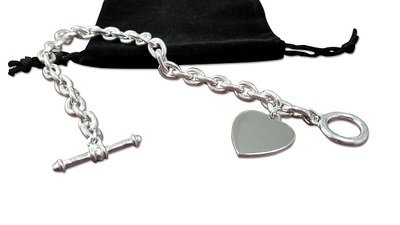 Heavy Link Charm Bracelet with Toggle and charms. Also available in 7 and 8 inch bracelets. Click on this photo to connect. Christmas Charms for earrings, bracelets and necklaces. 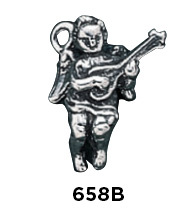 Click on the Angel Charm to connect to this charm, and then click on the category heading to see the entire collection. 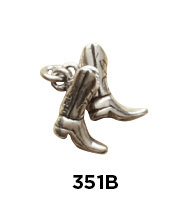 Cowboy ( 2 Pair ) Boots Charm $19.00 Choose any Charm from the WIld West category to create a unique charm bracelet! 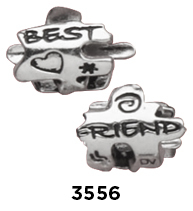 Click on the WIld West Charms category heading to view the entire category of charms. 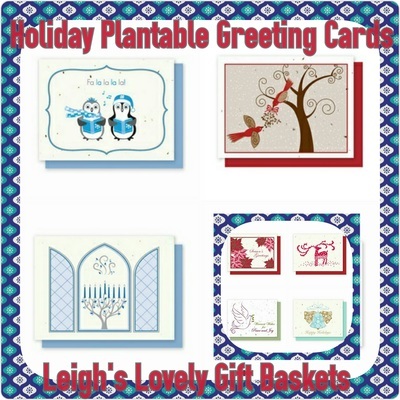 Plantable Greeting Cards For The Holidays and all year through! 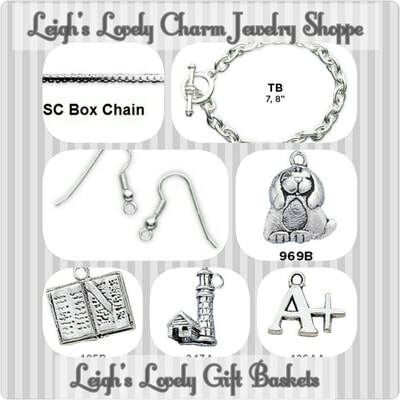 Genuine Sterling Silver bracelets, earrings, necklaces and charms from my Personalized Gifts Store pages! Click here to shop for a variety of gifts he'll love with free personalization!